Posted on October 7, 2017 by Emily Allbon. Categories: Barristers, Practice Area, Solicitors. The UKELA’s annual Student Careers information evening is being hosted by the chambers of Francis Taylor Building on the 8th November from 6pm. 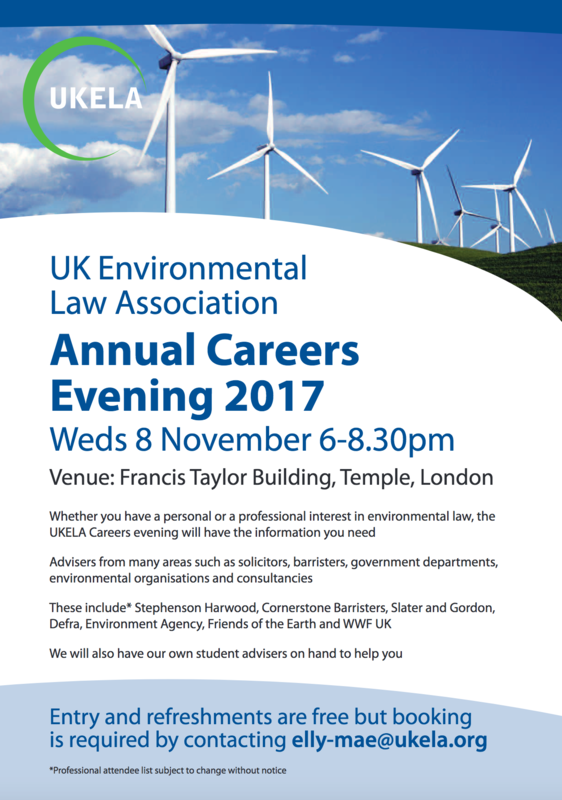 It is an excellent opportunity for students who are interested in pursuing a career in environmental law to ask any questions they may have about career paths of our wide range of advisers. Attendees will be able to meet representatives from private practice solicitors, barristers, government departments, NGOs and consultancies. The Student Careers Evening is free to attend, however, anyone interested should secure their place by email. It is not a requirement to be a member of UKELA in order to attend. However if anyone is keen to join, the association have a special offer at present where the rest of 2017 is free, when joining for 2018. Please see the UKELA website for further details. If anyone plans to attend please let Emily know if you’d like to write a review of the event for Lawbore!